Go to the Analysis module by clicking on the Analysis tab. (Menu option View / Analysis, command-R). We'll discuss them in details, starting with the first. Note that the examples used here are part of the demo cases that can be found in the 'Other' group of your Case module. You can freely play with these examples. Every time you start Complete Dynamics, the original demo cases are put back in the 'Other' group. After having collected your patient's information, the traditional approach is to look for rubrics in the repertory that match the patient's situation. The big disadvantage of this approach is, that for some of the patients symptoms a single repertory rubric is needed, while for other symptoms several rubrics can be found that together express the complaint. Whenever multiple rubrics are used to express a single symptom, the remedies that match that symptom are automatically counted stronger, so the symptom will get an exagerated value compared to other symptoms. Also, the patient does not express his symptoms in terms of repertory language. A collection of repertory rubrics is therefor not a real representation of the patients complaints, especially if no rubrics can be found that express the patients symptoms 100% literate. Complete Dynamics solves these problems by making a distinction between Symptoms and Rubrics. First the patient's symptoms, as they are analysed, can be entered. 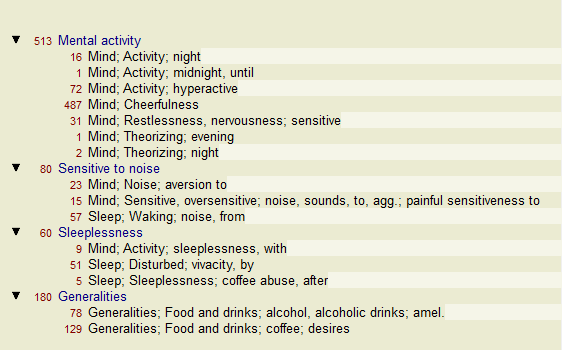 Secondly, repertory rubrics can be bound to these Symptoms. 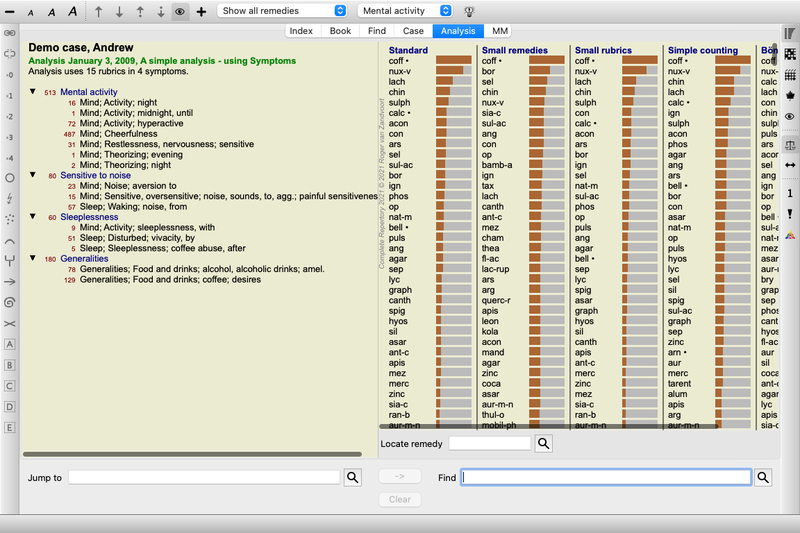 The Analysis module can automatically compensate the analysis results for the fact that some Symptoms are expressed with few rubrics, whereas other Symptoms are expressed with a large number of rubrics. So you are free to choose how many rubrics you need to adequately express the patient's symptoms into repertory rubrics, without disbalancing your analysis results! Symptoms are the language of the Patient - Rubrics are the language of the Repertory. There are more advantages to using Symptoms. Since symptoms are the language of the patient, it is easy to assign a ranking of importance to a Symptom, without having to explicitly manipulate the ranking of indiviual rubrics (we call these Symptom Weight and Rubric Weight, they are explained at another place). There are more advantages, but you'll see those for yourself. Of course for a quick and simple analysis, creating Symptoms causes some overhead that you might not want. In this case, just don't create Symptoms. All Rubrics are then automatically placed under a 'generic symptom', invisible to you. The variant with Symptoms is much more clear! With a Case opened and an analysis selected, a new Symptom can be added to an Analysis. (Menu option Case / Add symptom, control-S). To delete a Symptom (and all the Rubrics bound to it), select it in the list either with the mouse or keyboard, then press the Delete key. (Menu option Case / Delete selected). You can edit the Symptom details by double clicking on it. (Menu option Case / Edit symptom). A rubric is always added from the Book or Find module. (Menu option Case / Add rubric, control-R). Select a rubric, and press Enter. (Menu option Case / Add rubric, control-R). The Rubric is then added to the Symptom that has been selected as the 'current' Symptom in the Symptom list. From the toolbar, you can easily select another Symptom, to add the rubric to. 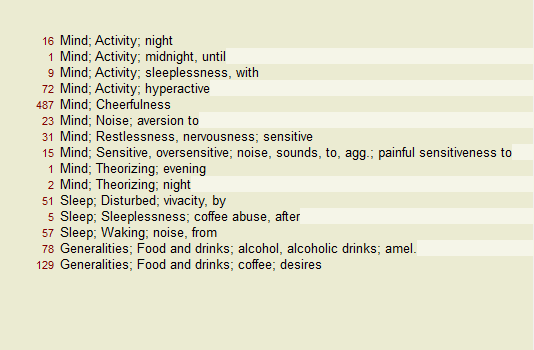 If no Symptoms are defined, you will see the text 'Generic symptoms'. Deleting a Rubric from the analysis is done by selecting it in the list, then press the Delete key. (Menu option Case / Delete selected). It is possible to change the order is which Symptoms are organized. 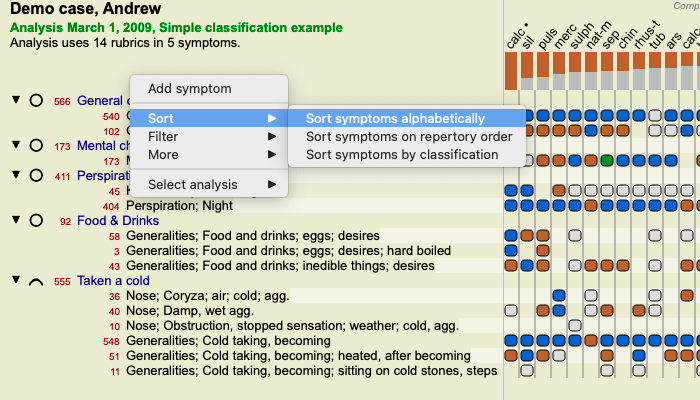 When a Symptom is selected, it can be moved. (Menu option Navigate / Move up, toolbar button , menu option Navigate / Move down, toolbar button ). A Rubric can be moved to the next or previous Symptom with the same menu options and toolbar buttons. Within a Symptom, Rubrics are always sorted according to their order in the Book.